The Mayor of the City of New York is elected in early November every four years and takes office at the beginning of the following year. The city, which elects the mayor as its chief executive, consists of the five boroughs (Manhattan, The Bronx, Brooklyn, Queens and Staten Island), which consolidated to form "Greater" New York on January 1, 1898. The consolidated city's first mayor, Robert A. Van Wyck, was elected with other municipal officers in November 1897. Mayoral elections had previously been held since 1834 by the City of Brooklyn and the smaller, unconsolidated City of New York (Manhattan, later expanded into the Bronx). The current mayor, now in his second term, is Bill de Blasio. He won re-election on November 7, 2017. The vast bulk of this page's contents is statistical: the main results, citywide and by borough, of each of the 32 elections to the Mayoralty of the City of New York since Greater New York was consolidated from the five boroughs in 1897-1898. There are brief comments about some of the elections, and separate articles have been written for those of 1917, 1977, 1997, 2001, 2005, and 2009. Different elections are compared in many of the individual notes, in two summary tables and in one specialized table. New York City's Mayoral elections have been marked by an interplay of factors that are magnified by the size of the population. There was a history of a large socialist vote, there is a history of tension between 'regular' and 'reform' politicians, and there has been electoral fusion, a factor not seen in most of the rest of the United States, with a resulting plethora of smaller, yet influential, third parties. 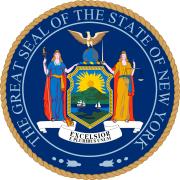 Direct elections to the mayoralty of the unconsolidated City of New York began in 1834 for a term of one year, extended to two years after 1849. The 1897 Charter of the consolidated City stipulated that the mayor was to be elected for a single four-year term. In 1901, the term halved to two years, with no restrictions on reelection. In 1905, the term was extended to four years once again. (Mayors Fiorello La Guardia, Robert F. Wagner Jr. and Ed Koch were later able to serve for twelve years each.) In 1993, the voters approved a two-term (eight-year) limit, and reconfirmed this limit when the issue was submitted to referendum in 1996. In 2008, the New York City Council voted to change the two-term limit to three terms (without submitting the issue to the voters). Legal challenges to the Council's action were rejected by Federal courts in January and April, 2009. However, in 2010, yet another referendum, reverting the limit to two terms, passed overwhelmingly. Principal source: The Encyclopedia of New York City (see Sources below), entries for "charter" and "mayoralty". See List of mayors of New York City. The September 11 attacks on the World Trade Center in Manhattan coincided with the primary elections for a successor to Mayor Giuliani, who was completing his second and final term of office. Many were so impressed by both the urgency of the situation and Giuliani's response that they wanted to keep him in office beyond December 31, 2001, either by removing the term limit or by extending his service for a few months. However, neither happened, the primary elections (with the same candidates) were re-run on September 25, the general election was held as scheduled on November 6, and Michael Bloomberg took office on the regularly appointed date of January 1, 2002. Mayor Havemeyer was a Democrat who ran as a Republican against the Democratic Tweed Ring in 1872. Votes in thousands for principal candidates only, generally those winning more than 4.0% (1/25) of the total vote. (Therefore, low votes may not be shown in a particular year for an otherwise significant party, such as Socialist or Conservative. For some of the lesser left-wing candidates before 1945, see #Collapse of the Socialist Party vote below.) Total vote includes that for all candidates and parties, major and minor. See the table above for more information about the candidates and parties involved. Blue indicates a candidate endorsed by the Democratic Party; pink one endorsed by the Republicans; and buff (or beige) one endorsed by neither party. (Darker shades indicate where a borough voted for a candidate who lost the citywide vote.) In 1981, Edward Koch ran on the tickets of both the Democrats and the Republicans. Although separate boroughs since 1898, the Bronx and Manhattan shared New York County and reported elections together until the separate Bronx County was formed in April 1912 and started her separate existence on January 1, 1914. The borough of Richmond changed its name to Staten Island in 1975, although the co-extensive Richmond County still retains that name. Although it was not uncommon for a candidate to carry all five boroughs in the same election, variations in voting patterns are noticeable. Since it started reporting separate returns in 1913, the Bronx has supported only one Republican (Fiorello La Guardia) and Manhattan has opposed only two successful candidates (Giuliani in 1993 and Bloomberg in 2001). On the other hand, in the eleven elections since 1965 that were contested between Democratic and Republican candidates (i.e. excluding 1981, when Ed Koch was endorsed by both parties), Staten Island has voted for only two Democratic candidates, Abe Beame in 1973 and Koch in 1985. Queens has voted for only three, Abe Beame in 1973, Koch in 1985, and DeBlasio in 2017. The City as a whole elected four of the Democratic candidates in those same eleven elections from 1965 to 2009. The Bronx supported all eleven, Brooklyn nine, and Manhattan six. Bill de Blasio, the incumbent mayor, won re-election to a second term, on Democratic and Working Families Party lines, over challengers Nicole Malliotakis on the Republican and Conservative party lines, Sal Albanese on the Reform Party line, Akeem Browder on the Green Party line, independent candidates Mike Tolkin and Bo Dietl, and Libertarian Party candidate Aaron Commey. Bill de Blasio, the city's elected Public Advocate, won 40.8% of the total Democratic primary vote and, by exceeding 40.0%, avoided an October 1 primary runoff with Bill Thompson, who won the second-highest number of primary votes, or 26.1%. (In 2009, Thompson had won the Democratic primary only to lose a close general election to Mayor Michael Bloomberg.) Christine Quinn, the Speaker of the New York City Council, came in third, with 15.7%, while none of the other candidates, including City Comptroller John Liu and former Congressman Anthony Weiner, won as much as 10%. De Blasio carried all five boroughs and Thompson came second in every borough except Manhattan, where he came in third behind Quinn. In the Republican primary, Joe Lhota, a former deputy mayor and former chairman of the Metropolitan Transportation Authority carried every borough but Staten Island, which was won by John Catsimatidis, a businessman, publisher and property developer. Catsimatidis, in losing, won nearly as large a percentage of his own party's vote (40.69%) as the Democratic winner, Bill de Blasio won of his (40.81%). The 61,111 valid votes cast in the Republican primary were less than one-eleventh of the 691,801 cast in the Democratic one held on the same day in the same polling places. The principal candidates were Mayor Michael Bloomberg, an independent running for the third time on the Republican and Independence Party lines, and New York City Comptroller Bill Thompson, running for the Democratic and Working Families Parties. Bloomberg had enjoyed pluralities of about 9% to 16% in most independent published pre-election polls and on Tuesday, November 3, he won his third term with 50.7% of votes over Thompson's 46%. Tony Avella represents a Queens district on the New York City Council. Out of the nearly 400 write-in votes, almost half or 184 (representing about one Democratic voter in 2,000) were some form or spelling of Mayor Michael Bloomberg. In 2005, Mayor Bloomberg won every borough but The Bronx (of which his Democratic opponent was the former Borough President) against a Democratic Party split by a divisive primary, in contrast to his first victory in 2001, when Bloomberg carried only Queens and Staten Island. Republican incumbent Rudy Giuliani could not run again due to term limits. As Democrats outnumber Republicans by 5 to 1 in the city, it was widely believed that a Democrat would succeed him in City Hall. However, billionaire Michael Bloomberg, a lifelong Democrat, changed his party affiliation a few months before the election in order to avoid a crowded primary, and ran as a Republican. The Democratic primary was meant to be held on September 11 but was postponed due to the September 11 attacks; it was instead held on September 25. The primary opened the way to a bitter run-off between the Bronx-born Puerto Rican Fernando Ferrer, and Mark J. Green, a non-Hispanic who attacked Ferrer's close ties to Rev. Al Sharpton, leaving the party divided along racial lines. In the Democratic Primary, Messinger defeated Rev. Al Sharpton, Sal Albanese and 2 others, avoiding a runoff election. In his 2005 book Ladies and Gentlemen, The Bronx Is Burning, historian Jonathan Mahler argues that the New York City blackout of 1977, with its accompanying rioting, enabled the law-and-order advocate Ed Koch to beat out his more left-wing opponents, including incumbent mayor Abe Beame, in the 1977 election. Note that the eventual winner, Rep. Ed Koch, could not win a plurality in any of the Five Boroughs for the initial Democratic primary. Rep. Bella Abzug took Manhattan, Mayor Abe Beame Brooklyn, Rep. Herman Badillo the Bronx, and NY Sec. of State Mario Cuomo Queens & Staten Island. In the Democratic run-off with Cuomo, Koch took Queens and three other boroughs, leaving Cuomo with only Staten Island. In the general election, Cuomo kept Staten Island and won back Queens, but lost the other three boroughs (Manhattan, Brooklyn and The Bronx) to Koch. In the Republican primary, Roy M. Goodman, a member of the New York State Senate, defeated Barry Farber, a radio commentator, by a vote of 41,131 to 31,078(57.0% to 43.0%). Farber, however, won the nomination of the Conservative Party of New York and won almost as many votes in the general election (57,437 or 4.0%) as Goodman did as the Republican nominee (58,606 or 4.1%). Some figures and anecdotes courtesy James Trager's New York Chronology (HarperCollins: 2003). Other numbers are from The World Almanac and Book of Facts, then published by The New York World-Telegram (Scripps-Howard), for 1943 (page 412) and 1957 (page 299), and from The Encyclopedia of New York City (see Sources below). Before 1975, the present Borough of Staten Island was formally known as The Borough of Richmond. Mayor Wagner broke with the regular Democratic organization which had supported him in 1953 and 1957, defeating their candidate, Arthur Levitt, in the Democratic primary 61% to 39%. At the same time, after running successfully with Lawrence Gerosa for Comptroller in the previous two elections, Wagner chose to run instead with Abraham Beame in 1961. Gerosa ran against Wagner for mayor as the "real Democrat" on a pro-taxpayer platform. 211,000 of Wagner's 1,237,000 votes came on the Liberal Party line, and 55,000 on the purpose-built Brotherhood line. Vincent Impellitteri, the mayor who succeeded mid-term after William O'Dwyer resigned on August 31, 1950, swept Manhattan, Queens and Staten Island in this special election, while Ferdinand Pecora (aided by the Liberal Party) took very narrow leads in The Bronx and Brooklyn. In this election, the Liberals heavily outpolled the American Labor Party in every borough but Manhattan and Staten Island, where the two parties' votes were almost equal. O'Dwyer received 867,426 Democratic votes and 257,929 on the American Labor Party line. The Goldstein vote was 301,144 Republican, 122,316 Liberal and 8,141 City Fusion. The No Deal Party (according to Chris McNickle in The Encyclopedia of New York City) was founded by the retiring maverick Republican Mayor Fiorello La Guardia to draw Republican votes towards Newbold Morris and away from the official Republican Party with whom La Guardia was having a dispute. The No Deal Party dissolved soon after the 1945 election. Newbold Morris was a Republican, while Jonah Goldstein was a Democrat until nomination day. Other vote was: Joseph G. Glass - Socialist - 9,304; Farrell Dobbs - Trotskyist Anti-War - 3,656; Eric Hass - Socialist Labor - 3,465; Max Shactman - Workers - 585; Scattered - 45. As in 1937, more voters in every borough voted on the Democratic line than on any other single line; but this time (unlike 1937) the Democrat carried Queens and Staten Island over La Guardia, shrinking the Mayor's overall citywide percentage lead from 20% to 6%. As in 1937, La Guardia's overall margin of victory depended on the American Labor Party, which again won more votes than the Republicans in The Bronx. While the total vote and Republican vote were almost identical in 1937 and 1941, the ALP line lost 47,000 votes (2.4%), almost entirely from Manhattan (-18,000) and Brooklyn (-26,000), as the vote on La Guardia's other lines (Fusion, Progressive and United City) dropped from 187,000 (8.3%) to 86,000 (3.7%). The Democratic Party gained about 160,000 votes lost by La Guardia (and about 7½% of the total). In both Queens and Richmond (Staten Island), the swing was even greater: La Guardia lost over 15% of the total vote (and the Democrats gained over 15%) from 1937, as his lead there flipped from roughly 56%-44% to 39%-60%. Note that the leading line in every borough, and in the City as a whole, is the Democratic line for Judge Mahoney. Running on the Republican line alone (as he did when losing the election of 1929), Mayor La Guardia would have lost every borough, but he carried all five when the American Labor Party line was added. The ALP line did better than the Republican line in The Bronx, although worse than the Democratic one. There were also 2,307 votes for Emil Teichert on the Industrial Government line. While opposed by Tammany Hall, McKee enjoyed the support of Democratic President (and former Governor) Franklin D. Roosevelt, who declared neutrality when his ally Mayor La Guardia was running for reelection in #1937. (See Ed Flynn's comments about FDR's 1936 contribution to starting the American Labor Party in the #References below.) According to Michael Tomasky, La Guardia, who had lost the #1921 Republican Mayoral primary to Manhattan Borough President Henry Curran, did not enjoy the support of a united Republican Party when he won the party's nomination and lost the general election in #1929, but was able to win over Republican organizational support in 1933. The 1933 LaGuardia vote was 446,833 Republican and 421,689 City Fusion. The O'Brien vote was 570,937 Democratic and 15,735 Jeffersonian. There were also 1,778 votes for Henry Klein-Five Cent Fare & Taxpayers; 472 for Aaron Orange - Socialist Labor; and 118 for Adolph Silver - Independent Union. In 1933, a year that might otherwise have favored the Socialist Party's chances, the New Deal began, Morris Hillquit died, Norman Thomas refused to run again for mayor, and the Socialist vote (previously as high as one-eighth to one-fifth of the total) collapsed irretrievably from a quarter of a million to sixty thousand (one-thirtieth of the total). Many supporters of Thomas's 1929 campaign defected (some, like Paul Blanshard, also leaving the Party) to support Fiorello La Guardia. By the time of the next mayoral election in 1937, which the Socialist Party decided by internal referendum not to contest, many reformers and trade-unionists who wanted to support major-party progressives like La Guardia (R-ALP-Fusion), Gov. Herbert Lehman (D-ALP) and Pres. Franklin D. Roosevelt (D-ALP) from outside the two-party structure backed the American Labor Party (ALP), the Social Democratic Federation and later the Liberal Party of New York. After a disastrous gubernatorial campaign in 1938 (where Thomas and George Hartmann won only 25,000 votes out of over 4.7 million), the Socialist Party lost its separate line on the New York ballot, allowed its members to join the ALP, and indeed encouraged them to do so. In 1939, the Socialist Harry W. Laidler, a co-founder of the Intercollegiate Socialist Society and League for Industrial Democracy, was elected (with the help of proportional representation) to the New York City Council on the ALP's ticket, but lost its renomination two years later because of rivalry with the Communists. † In 1894 and in 1897, Lucien Sanial was the mayoral candidate of the Socialist Labor Party before both the SLP and the Social Democratic Party each split in two. In 1901, one faction of the SLP, led by Morris Hillquit, and one faction of the SDP, led by Eugene V. Debs, united to form the Socialist Party of America, which soon drew away many votes formerly cast for the SLP. For further details, see Hillquit's History of Socialism in the United States (1910) and Howard Quint's Forging of American Socialism (1964), both cited in the #References at the end of this article. Joseph V. McKee, as the (popularly elected) President of the Board of Aldermen, became Acting Mayor upon the resignation of elected Mayor Jimmy Walker on September 1, 1932. McKee's write-in total is, in fact, the highest any New York City election would ever see. For the election after the next one, voting machines which would make write-in voting much more difficult were introduced. Machines of this basic design are still being used. Lewis Humphrey Pounds was President of the Borough of Brooklyn from June 1913 to December 1917. This was the last of many campaigns for different offices by Morris Hillquit, a co-founder of the Socialist Party of America, who died in 1933. Hillquit had won over 21% of the vote for mayor in 1917. There were also 5,805 votes for William Weinstone - Communist and 320 votes for Lawrence Tracy - Commonwealth Land. The great stock market crash hit Wall Street on October 24–29, 1929, less than two weeks before Election Day. Richard Edward Enright was New York City Police Commissioner from 1918 to 1925. Notes: The Single Tax on land values was the proposal and platform of Henry George, who ran for mayor in 1897 and 1886. D. Leigh Colvin later contested the U.S. presidential election of 1936 for the Prohibition Party. The Fall 1917 election would have been exciting even had it occurred in peacetime. In September, the City held its first-ever primary elections for mayor. The sitting independent Mayor, John P. Mitchel, who had enjoyed Republican support under Fusion in 1913, narrowly lost the Republican primary to William Bennett, after mistakes and frauds led to a series of recounts. When negotiations between the parties failed, Mitchel ran alone as a Fusion candidate against Bennett, the Socialist Morris Hillquit and John F. Hylan, the regular Democrat supported by Tammany Hall and William Randolph Hearst. However, the elections happened after the United States had declared war on April 6. Hillquit and the Socialist Party quickly and vigorously opposed the war, which Mitchel vigorously supported. Hillquit's anti-war position helped the Socialists win their highest-ever vote for mayor, but also led to vitriolic denunciations by many, including The New York Times and former President Theodore Roosevelt. Mitchel and Hillquit each won less than quarter of the vote, while Hylan, who had been non-committal about the war, won the election with less than half the vote. However, as in 1897, the numbers suggest that Tammany Hall might have won even against a unified opposition. ¶ The Bronx and Manhattan, although separate Boroughs since 1898, shared New York County and reported their votes together until Bronx County was formed in April 1912 and came into its separate existence on January 1, 1914. Mayor William Jay Gaynor, who had survived being shot in the throat by a disappointed office-seeker in 1910, died at sea from the indirect effects of his injury on September 10, 1913. He was succeeded for the rest of 1913 by Ardolph Loges Kline, the acting president of the board of aldermen. The election of 1897 was held just before the Five Boroughs formally consolidated into Greater New York in 1898, so it was the present city's first mayoral election. For preliminary results for all the municipal offices, broken down into smaller districts, see "Democrats Take All - The Tammany Ticket Makes Almost a Clean Sweep of the Greater City - Only Two Republicans in the Council..." in The New York Times, November 4, 1897 (seen April 11, 2008). For Lucien Sanial, see the table notes under #Collapse of the Socialist Party vote above (1933) and ALL THEY NEED IS VOTES; THREE CANDIDATES FOR MAYOR WHO WOULD MAKE A STIR. in The New York Times for Wednesday, November 4, 1894, page 19. It appears from the percentages to be an open question whether the Republican Party's decision in 1897 not to support Seth Low's Fusion campaign caused his defeat by splitting the vote against Tammany Hall. Republicans withdrew in Low's favor in 1901 (when he won) and in 1903 (when he lost). ^ For further details, see Third Term No Charm, Historians Say by Sewell Chan, The New York Times "City Room", published and retrieved on October 1, 2008. ^ a b Sewell Chan and Jonathan P. Hicks, Council Votes, 29 to 22, to Extend Term Limits, The New York Times, published on-line and retrieved on October 23, 2008. ^ Fernanda Santos: The Future of Term Limits Is in Court, The New York Times, New York edition, October 24, 2008, page A24 (retrieved on October 24, 2008), Judge Rejects Suit Over Term Limits, The New York Times, New York edition, January 14, 2009, page A26, and Appeals Court Upholds Term Limits Revision, The New York Times City Room Blog, April 28, 2009 (both retrieved on July 6, 2009). The original January decision by Judge Charles Sifton of the United States District Court for the Eastern District of New York (Long Island, Brooklyn, Queens and Staten Island) was upheld by a three-judge panel of the United States Court of Appeals for the Second Circuit (Vermont, Connecticut and New York state). ^ a b Hernandez, Javier C. (November 3, 2010). "Term Limits in New York City Are Approved Again". The New York Times. ^ See, for example, these stories from The New York Times: "In Crisis Giuliani’s Popularity Overflows City", by Jennifer Steinhauer, Sept. 20, 2001, "A Shift in the Ritual, and Meaning, of Voting", by Mirta Ojito, Sept. 26, 2001 and "Giuliani Explores A Term Extension Of 2 Or 3 Months", by Jennifer Steinhauer with Michael Cooper, September 27, 2001. ^ Sewell Chan, Bloomberg Says He Wants a Third Term as Mayor, The New York Times, published and retrieved on October 2, 2008. ^ "Term limits will land on city ballot in Nov". New York Post. August 12, 2010. ^ "Statement and Return Report for Certification - General Election - November 5, 2013" (PDF). Board of Elections in the City of New York. Retrieved 24 July 2015. ^ World Statesmen—Boroughs of New York City Archived 2012-02-11 at the Wayback Machine retrieved on June 25, 2008. See also the entry for "Borough Presidents" by Nora L. Mandel in The Encyclopedia of New York City (Yale 1995), cited in Sources below. ^ Robert A. Slayton, Empire Statesman: The Rise and Redemption of Al Smith, The Free Press, New York, 2001, ISBN 0-684-86302-2, pages 115-116 and 221-225. See also 1917 New York City mayoral election. ^ William Mills Ivins Sr. (1851–1915). See the Wikipedia entry for Ivins' son, William Mills Ivins Jr. (1881–1961) and a long, contemporary New York Sunday Times magazine feature article, "William M. Ivins, a Man of Many Facets; A Character Study of the Republican Candidate for the Mayoralty" (October 22, 1905, page SM1). ^ Young, The Single Tax Movement in the United States, page 95. See also History of Socialism in the United States by Morris Hillquit (5th edition, New York 1910, reprinted New York 1971 by Dover: ISBN 0-486-22767-7), pages 249-253, and The Forging of American Socialism by Howard Quint (2nd edition, Indianapolis 1964: Bobbs-Merrill), pages 37-43.